This operates on all meshes under the current selection. If nothing is selected, all fragments will be modified. It is recommended to assign shaders before breaking and connection to the simulator, but it is still possible to change the unbroken object's shaders and re-propagate after baking. You can run the shading/texturing process at any stage, after a live-sim, after baking to keys or disk, or after running replace-with-keys. However, if you have already run the shading/texturing process, then subsequently run replace-with-keys, you will have to re-run shading/texturing afterwards. For scenes created with versions prior to 1.6.0, you will have to delete the fragmentGroup, disconnect and reconnect all input objects, and re-bake the simulation, before shading/texturing will work. The shader to assign to interior faces is specified under the inputs tab. 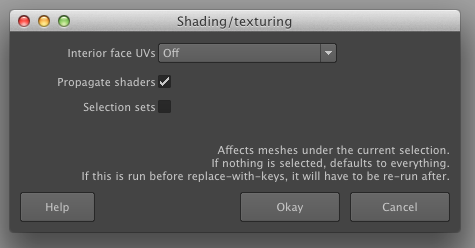 Make sure the shader has a shadingGroup of its own, which it may not have if you duplicated it. 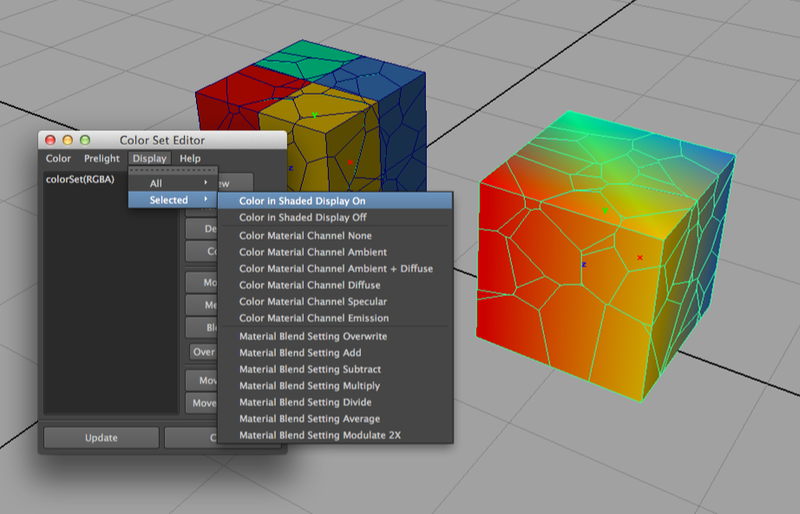 The widget displays the connection to the fxInteriorShader attribute on the intermediate shape node of the input object. This is also editable from the attribute editor, under Extra Attributes, which allows you to change the interior shader after running replace-with-keys, when the world node will have been removed. Assume you've broken an object, with or without a simulation, and you now want to change the shader(s) on the input object. You can't simply drag-and-drop the shader on to the broken shape, it has to be attached to the unbroken (intermediate) shape. The graph for the cube is shown below. The cube has two shapes, a non-intermediate shape polySurfaceShape1 which displays the output of the breakGeo2 node (when you rewind to the start frame), and an intermediate shape pCubeShape1 which holds the original unbroken geometry. It is to that intermediate shape that the shaders were originally attached. You can see exterior faces are assigned the initialShadingGroup and interior faces get blinn1. 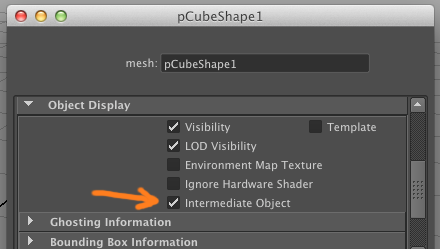 It is to pCubeShape1 NOT polySurfaceShape1 that you must attach new shaders. Now clear your selection and re-run shading/texturing from the menu. 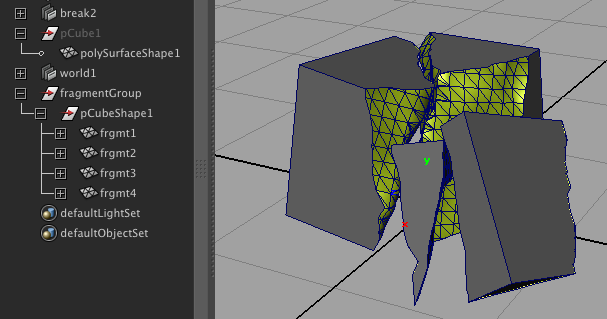 Assuming you assigned two phongs to pCubeShape1, they will propagate to the 4 fragment meshes, and in addition to the polySurfaceShape1, which is visible before the break occurs. 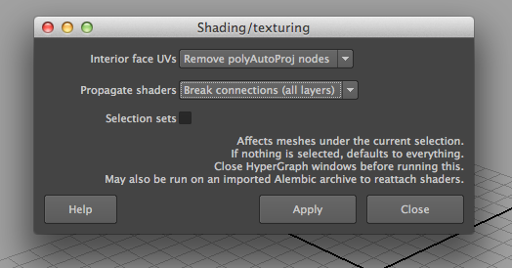 As of version 1.6.1, shaders can be reattached to Alembic archives imported into the scene. Use File->Import, not the Pipeline Cache menu. This example assumes the meshes are not connected to a simulator. 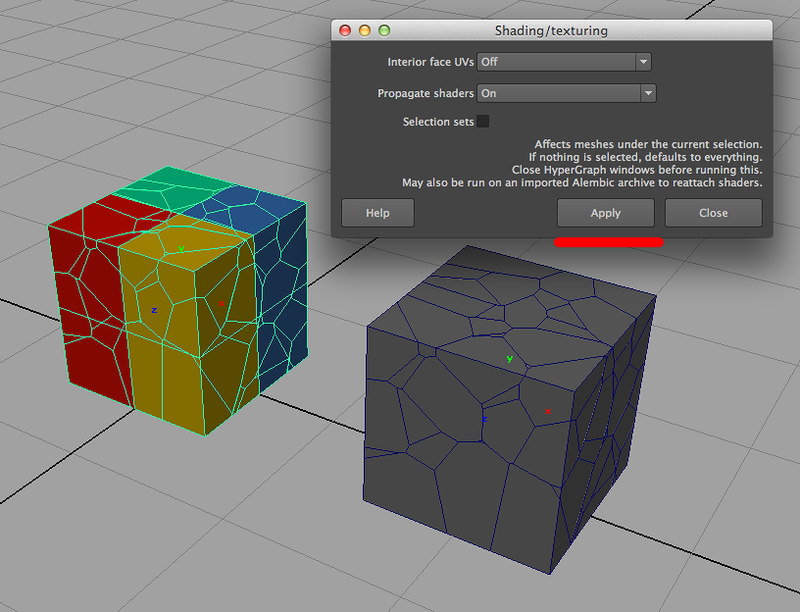 Select it and choose Fracture -> Shading/texturing (option box), then Apply. The color sets are automatically propagated and just have to be displayed. 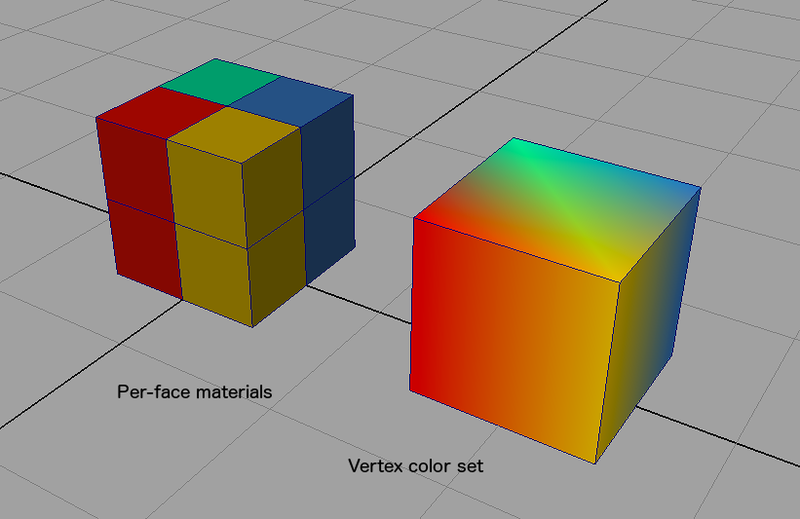 The same automatic process cannot be applied for shaders because Maya plug-in nodes cannot assign shaders to the faces of meshes they produce; shader attachments are represented in Maya using DG connections to the mesh shape node, which is always downstream of the plug-in node that produces the mesh. Make sure you have nothing selected then click Apply and it will disconnect all the shaders and delete the projection nodes created for the interior faces. Then re-run it with automatic projection and propagate shaders on. This page was last modified on 26 November 2017, at 18:35. This page has been accessed 23,592 times.